It’s America’s most classic dessert and yet, the humble apple pie is anything but basic. Learn the ins and outs on how to make the most perfect apple pie, ever. The humble apple pie is much more than a heartwarming dessert that goes great with a scoop of ice cream; it’s a classic American treat that brings the family together. Almost everyone has a fond memory or a sense of nostalgia when they think of apple pie or smell it baking in the oven. Whether you couldn’t imagine the holidays without your grandmother’s apple pie or it’s your favorite way to end Sunday supper, the simple apple pie will always have a place in our kitchens and in our hearts. There are several twists and variations on the traditional apple pie, and while all of them are different, they are all certainly delicious! But as they say, nothing beats the classic. To make apple pie, you can make a two-crust pastry dough recipe from scratch, but you can also get a head start with a box of Pillsbury refrigerated pie crusts for a convenient, yet homemade-quality pie crust. If you are using a refrigerated crust, let the crust to stand at room temperature for about 15 minutes before unrolling. If you are using a frozen crust, remove it from the box and thaw at room temperature for 60 to 90 minutes before unfolding. Here’s how to make our Perfect Apple Pie recipe using refrigerated pie dough. Step 1: Heat oven to 425°F. Place 1 pie crust in ungreased 9-inch glass pie plate. Press firmly against side and bottom. Step 2: In a large mixing bowl, gently mix filling ingredients and spoon into your crust-lined pie plate. Place the second crust on top, and wrap any excess top crust under the edge of the bottom crust. Press edges of the two crusts together to seal them, and use your fingers to make a fluted (crimped) edge. Use a knife to make slits or cut out shapes from the top crust. Step 3: Bake 40 to 45 minutes or until apples are tender and crust is golden brown. Cover edge of crust with 2- to 3-inch wide strips of foil after first 15 to 20 minutes of baking to prevent excessive browning. Granny Smith: These apples are the classic choice for a perfect pie. Tangy and tart, they also have a firm flesh that doesn’t break down in the oven. Honeycrisp: Firm with a juicy sweetness, this apple complements any other apple variety. Be sure to get them in the fall while they’re in season! Golden Delicious: If you prefer a softer, sweeter apple pie, this is the variety for you. Its natural sweetness comes through in every delicious bite. Gala: Mildly sweet and crisp, these apples don’t get mealy in the oven. They’re a great year-round choice. Red Delicious: These apples are mildly sweet, with a crisp exterior and grainy flesh. However, they lack the tartness that enhances the rich apple flavor of pie, and they break down in the oven to a mushy mess. Peel 6 medium apples and slice them thinly until you have 6 cups. In a large bowl, combine all the filling ingredients except the apples and lemon juice. Step 3: Mix well. Toss lemon juice and apples in the mixture to coat thoroughly. And there you have it! A cinnamon-tossed apple filling that will create heavenly smells in the kitchen and bring your whole family to the table. Depending on the recipe, you should cook or bake your apple pie anywhere from 40 to 60 minutes. When finished baking, the crust should be golden brown. After you take your apple pie out of the oven, allow it to cool on a cooling rack for about two hours before serving. To prevent the baked edges of your pie from overbrowning, cover the edges with foil after the first 15 minutes of baking or as directed on the recipe. Here’s an easy way to do it: cut a square piece of foil that’s big enough to cover the entire pie, then cut out a large hole in the center that’s the same width as the pie. Place it over the top of the pie so just the edges are covered by the foil, leaving the center open. We already showed you how to make a basic two-crust pie, and making a one-crust apple pie is even easier! We recommend finishing your apple pie with a crumbly, streusel topping like with our Sour-Cream Apple Pie recipe. Lattice-topped pies offer an impressive presentation, but the technique is actually easy to learn. Follow the recipe for a two-crust pie or use one box of refrigerated dough. Line the pie plate with the first crust, leaving one to two inches extending beyond the edge after it’s pressed into the pan. Unroll the second crust and cut into ½-inch strips using a pizza or pastry cutter. Weave the top strips over and under the bottom strips, alternating. Watch the video below to find out how to make this process even simpler! Then go ahead and try this method with our Caramel Apple Pie. There are three really simple ways to kick your presentation up a notch by employing different methods for the edges of your pie crust. We’ll show you how to finish your pie with scalloped edges, rope edges and forked edges. For scalloped edges, trim the dough even with the edge of the pan and form a stand-up rim that extends over the edge by ½ inch. Place your thumb and index finger about an inch apart on the outside of the raised crust edge. With your other index finger, push the pastry toward the outside to form a scalloped edge. For a rope or pinched edge, trim the dough even with the edge of the pan and form a stand-up rim that extends over the edge by ½ inch. Place the side of your thumb on the pastry edge at an angle. Pinch the pastry by pressing the knuckle of your index finger down into the pastry toward your thumb. For a forked edge, trim the dough even with the edge of the pan. Dip a fork tine in flour, then press the fork into the crust edge, facing inward, without pressing through the pastry. Rotate the tines to always face the center of the pie as you work your way around the edge. And when it’s time for your beautifully decorated pie to go in the oven, make sure to follow our tips to keep that pie crust from burning. You can serve apple pie any number of ways and while it’s perfectly yummy on its own, we do have a few suggestions on how to double the decadence! You may have heard of apple pie à la mode (translation: apple pie served with a scoop of ice cream). This is by far one of the most popular ways to serve apple pie, and for good reason! Warm up a slice of apple pie in the microwave for a few seconds and top with ice cream or serve it on the side. If one dessert is enough or you don’t have any ice cream on hand, you can add a drizzle of caramel ice cream topping and/or sprinkle pecans over top like we did with our beloved Caramel Apple Pie with Pecans recipe. You can also top your apple pie with a decadent Caramel-Apple Cream Topping, which tastes even better with an extra drizzle of caramel ice cream topping. To keep apple pie fresh, allow it to cool for two hours after baking. Then cover the entire pie with plastic wrap or aluminum foil and store at room temperature. Apple pie will stay fresh for up to two days at room temperature. If somehow you’ve still resisted eating the entire pie, you can store it in the fridge for two additional days. When you’re ready to eat, heat your slice in the microwave for a few seconds. Apple pie leftovers? Let’s just say we’d be awfully surprised if you had any! But, on the off chance that there are a few slices lingering, here’s how to handle it. Fruit pies freeze surprisingly well. Place them in the freezer uncovered until frozen, then wrap them tightly in plastic or foil, and put them back in the freezer. Apple pie will hold up in the freezer for up to four months. When you’re ready to eat, thaw the pie at room temperature for an hour and then reheat in the oven at 375°F on the lowest oven rack for 35 to 40 minutes, or until warm. If you’d like to make a few apple pies to keep in the freezer so you’ll always have a dessert option in a pinch or to get a head start on holiday baking, you can also check out this practical tutorial for freezing apple pie before it’s baked. Don’t let a pie pan (or lack thereof) get in the way of baking an apple pie. If you don’t have a pie pan or don’t want to spend the money on one, we can still satisfy your apple pie cravings with these apple pie flavor-inspired recipes that don’t use a pie pan. Now that you have cracked the code on how to make apple pie, you can set your sights on making one of these pies with a slight twist. Some of our most popular “apple pie” recipes aren’t pies at all. These recipes aren’t made in the traditional pie form, but still give a nod to the apple pie flavors we all know and love. 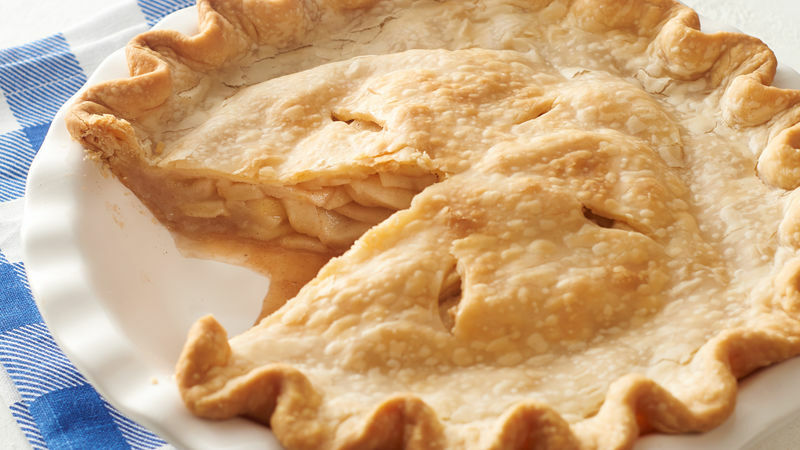 Now that you’ve mastered the classic apple pie, find another pie to try!